Assoc Prof David Ng Ching Yat, Dr Lau Teck Chai, MBA student Yuen Mun Kwun and alumnus Lim Boon Keong, all from or formerly of the Faculty of Accountancy and Management (FAM), won the Best Paper Award in the 3rd International Conference on Science and Social Research (CSSR) held at The Everly, Putrajaya from 6 to 7 December 2016. The international conference was organised by Universiti Teknologi MARA (UiTM) and the Institute of Research Management and Innovation (IRMI). The objective of the conference was to facilitate the publication of research findings in high quality journals and enhance the visibility of researchers. This conference serves as a platform that enables researchers to present their findings and share innovative ideas, knowledge and technologies, all while expanding their social network beyond their areas of expertise. 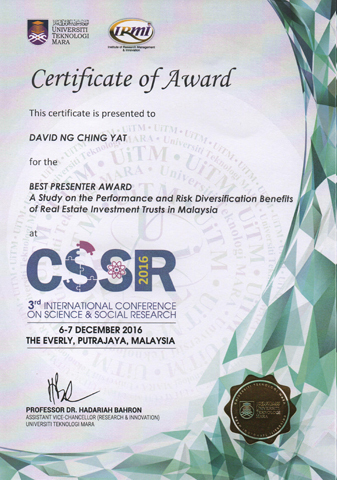 The researchers submitted to the conference their paper titled “A study on the Performance and Risk Diversification Benefits of Real Estate Investment Trusts in Malaysia”, which focused on utilising the Sharpe, Treynor and Jensen measures to investigate the risk diversification benefits of Real Estate Investment Trusts (REITs). The findings from the paper provide a clear understanding and comprehension of REITs performance to portfolio managers and investors as a possible investment. At the same event, Ng also won the Best Presenter Award. 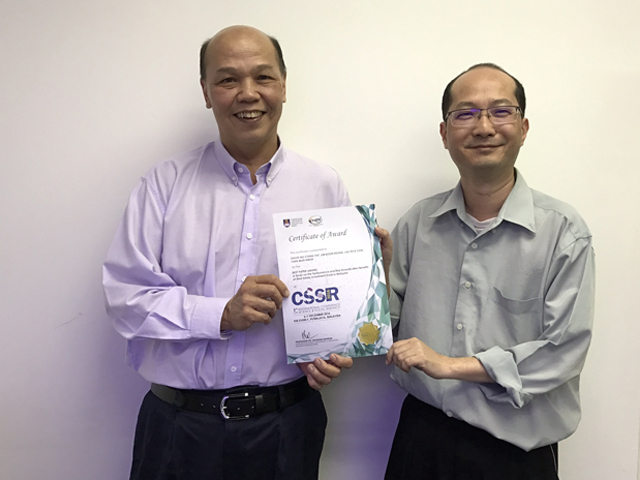 “CSSR 2016 provided us an ideal platform to present our Social Science research with other academics and industry personnel working in similar research fields. This was only my second experience presenting a research paper, and it was to a larger audience than the last. We were excited to be chosen for the Best Presenter and also the Best Paper Awards. This has provided us with extra motivation in continuing with our research and to present more papers at international conferences. Our gratitude also goes to UTAR for sponsoring us to attend this conference,” said Ng.